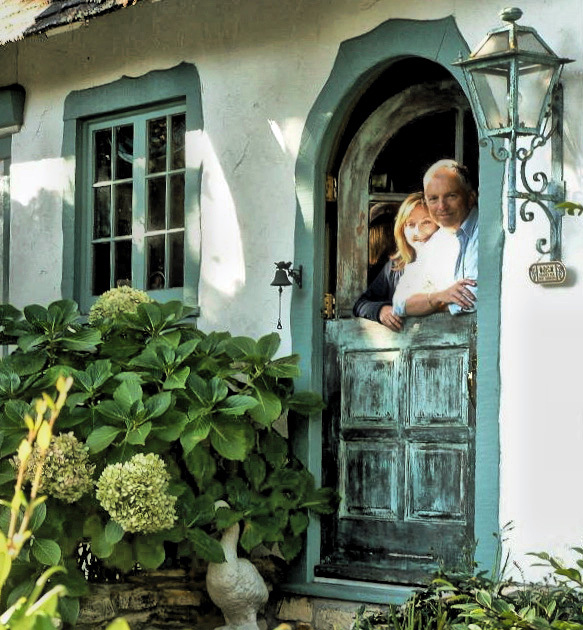 There is something so friendly and small-town about a half-open dutch door . I covet one in our little house and admire them all over town. They were first used in the early 1700’s in the Netherlands as a clever way to let in fresh air and light, while keeping the livestock out of your living room. 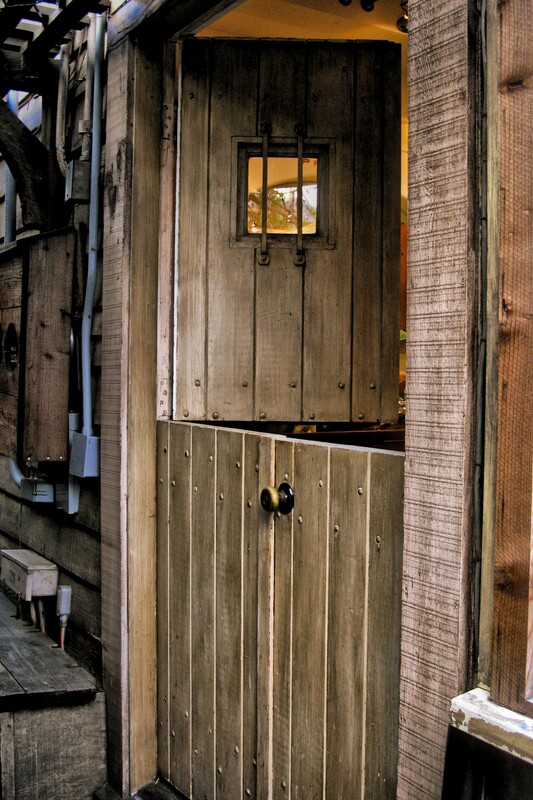 The 1950’s saw a surge in popularity again as neighbors whose homes were only a few feet apart enjoyed chatting with each other over the open top door. I put them right up there with “the front porch” as sure-fire ways to say “Welcome”. 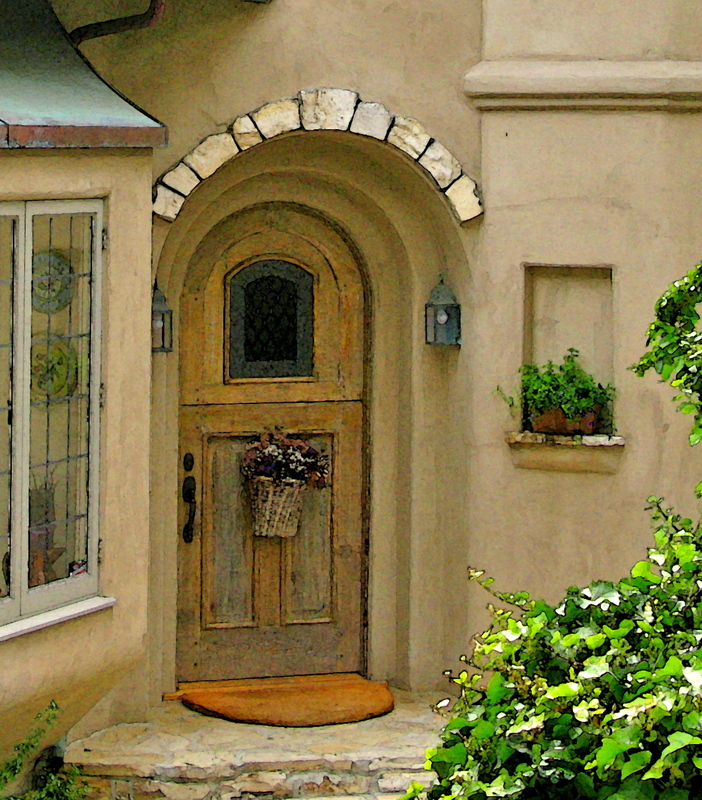 The dutch door is not very practical in my native state of Kansas. There are maybe 20 days a year temperate enough to leave my door open. On those days I use the screen door. But what if there were almost NO BUGS. 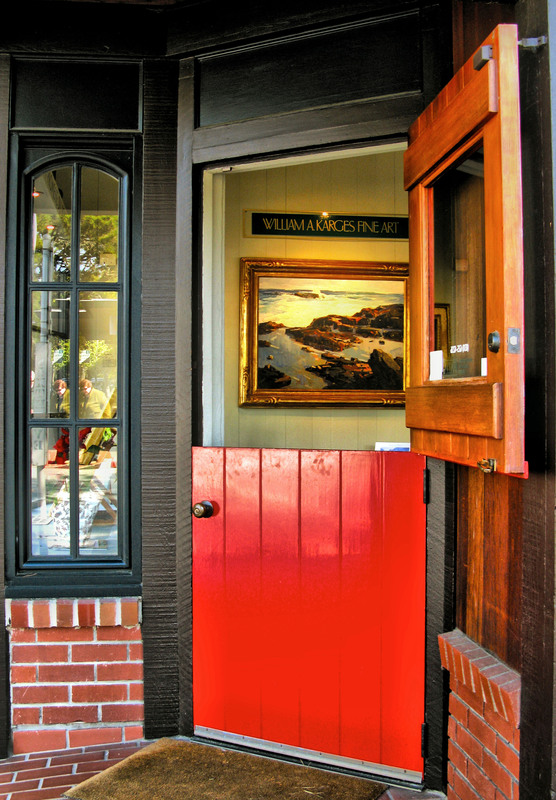 Wow- I could have a dutch door like these in Carmel. 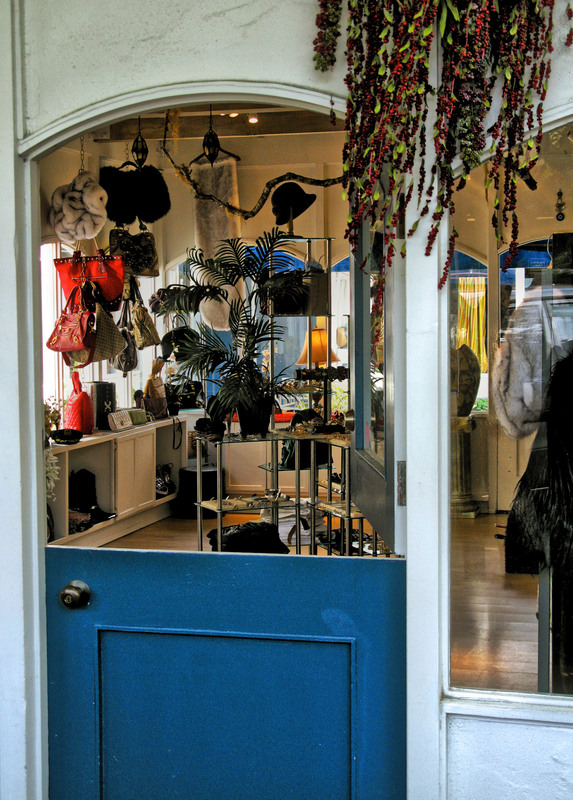 And when I am walking around town, I am far more likely to enter a restaurant or shop with its open door than one closed up tight. I decide to take a walk around town and show you some doors. 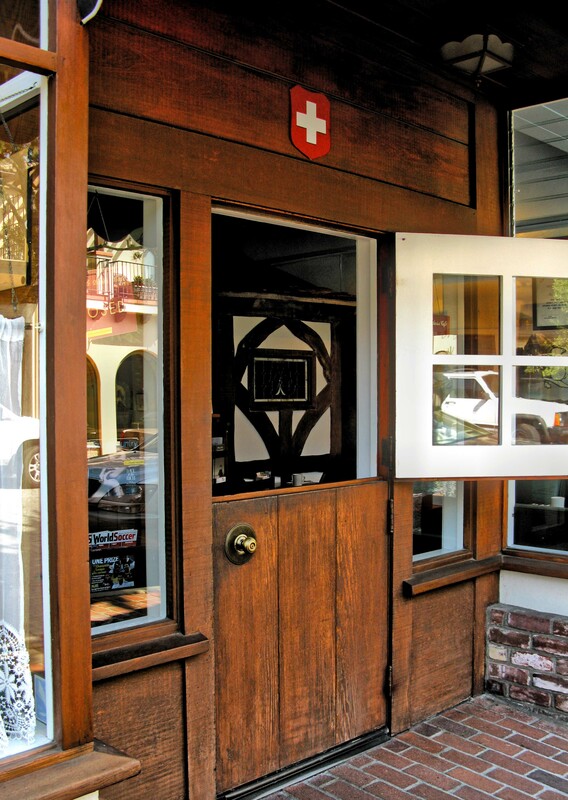 The Little Swiss Cafe has its door open. Tantalizing smells waft out and I can hear conversation and the friendly clank of silverware. 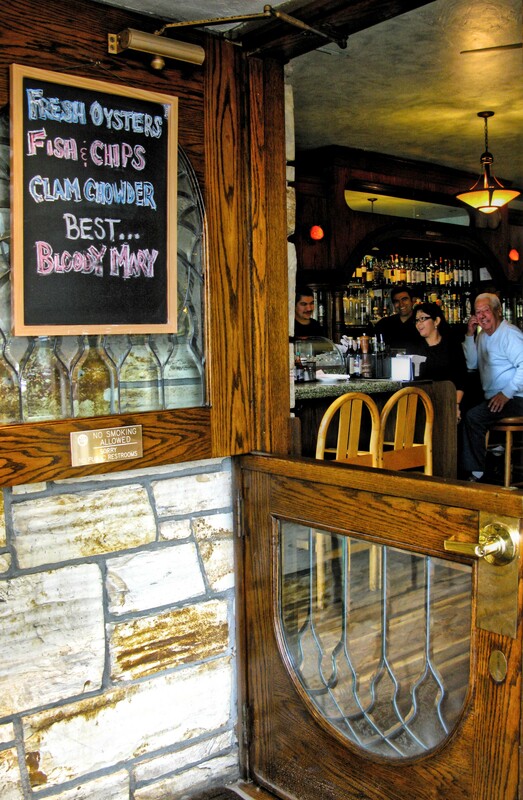 Aw Shucks is one of our favorite places to sit at the bar and have seafood and a drink. These patrons grin when I tell them to ” smile, you are being blogged”. 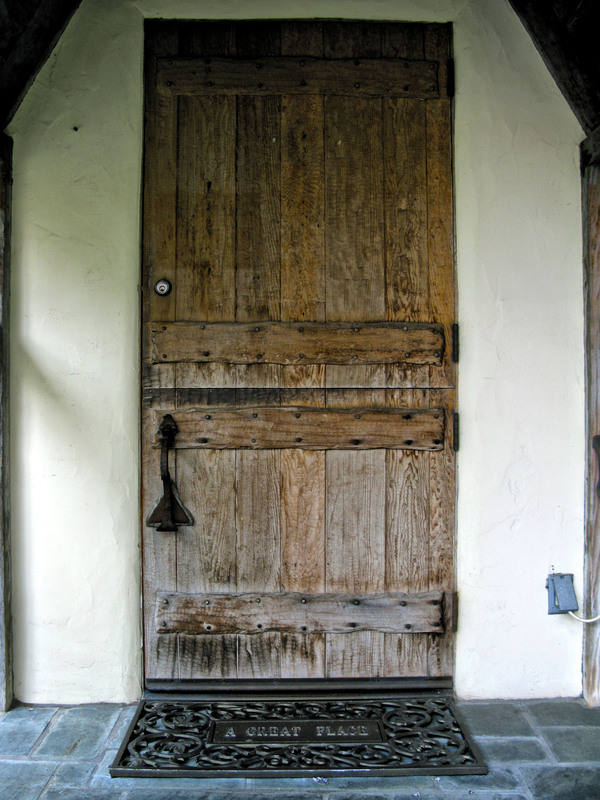 This door at the Cottage is closed today. 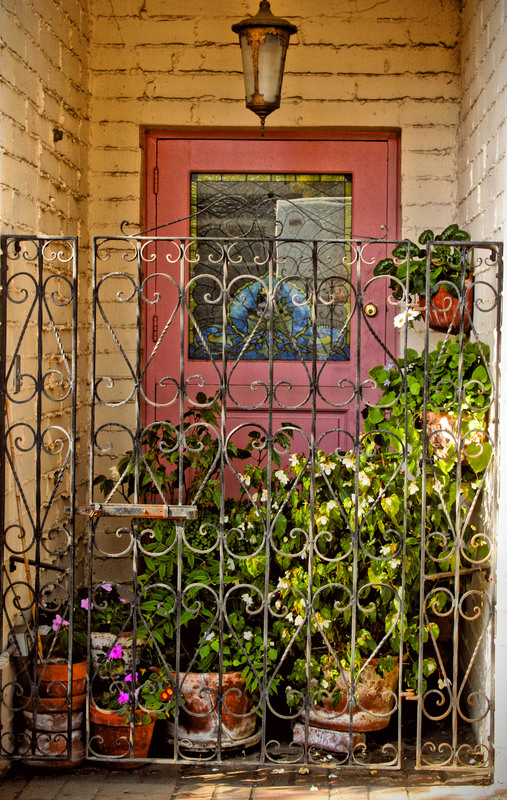 Inside , a small table sits in the doorway and is always occupied when the top half is open to the little pot garden. 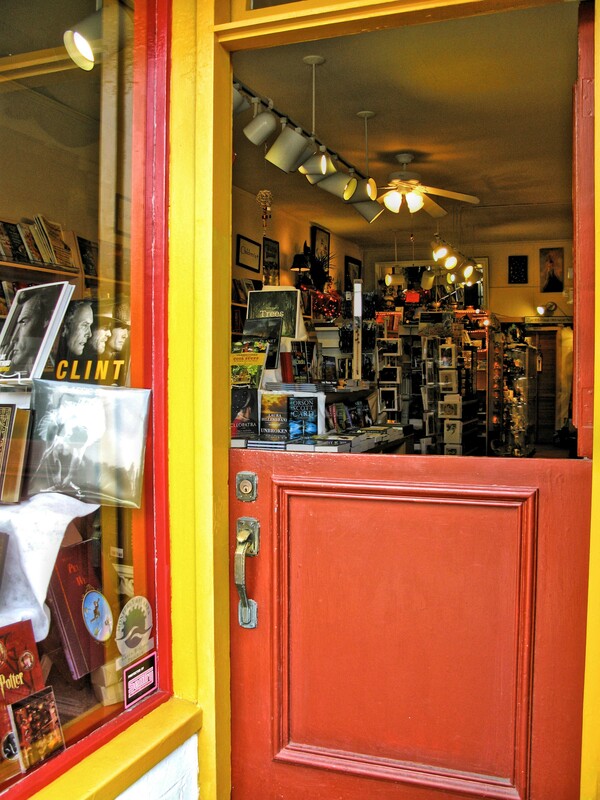 I stroll by The Pilgrim’s Way bookstore. Incense and new age music drift out. 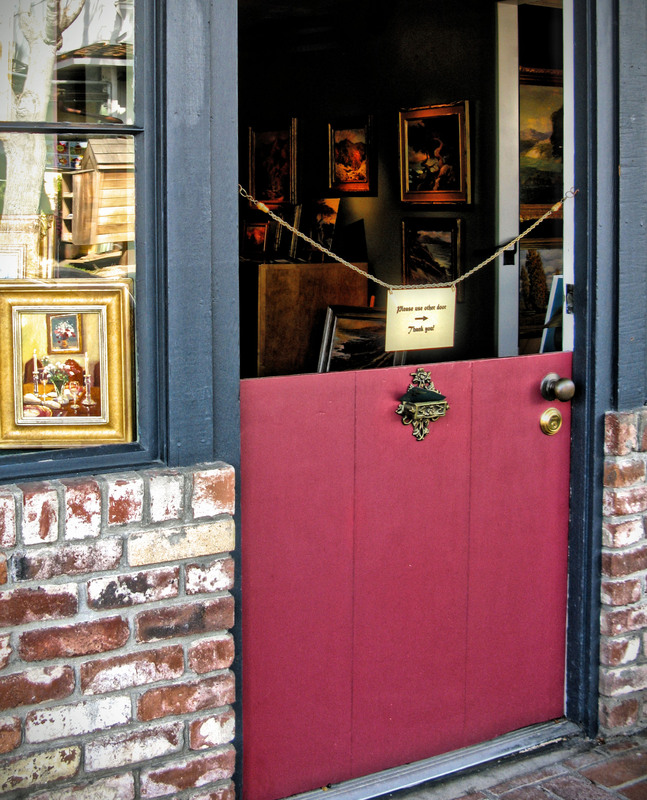 The open doors of the many art galleries always tempt me in to get a better look at a painting or sculpture. B and G Jewelers is open. 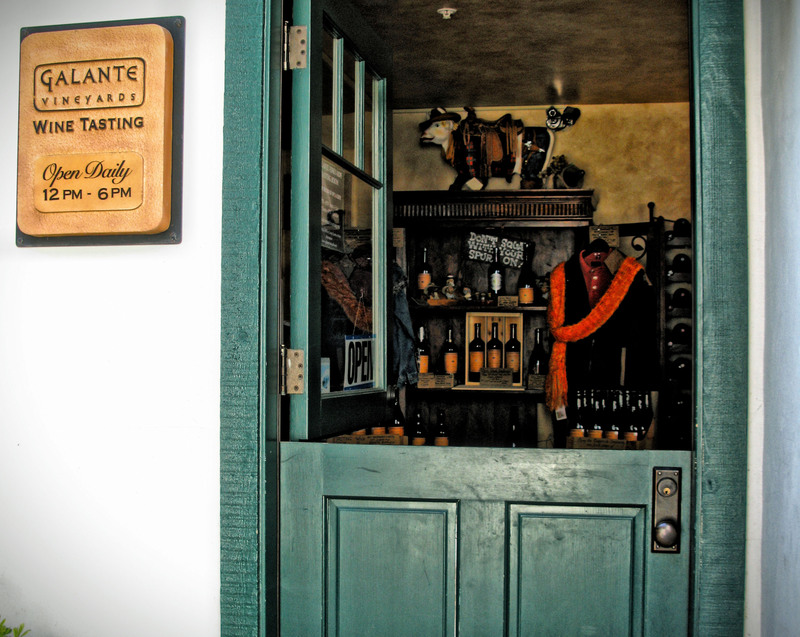 I think their door is one of the handsomest. and A Great Place are not open yet. 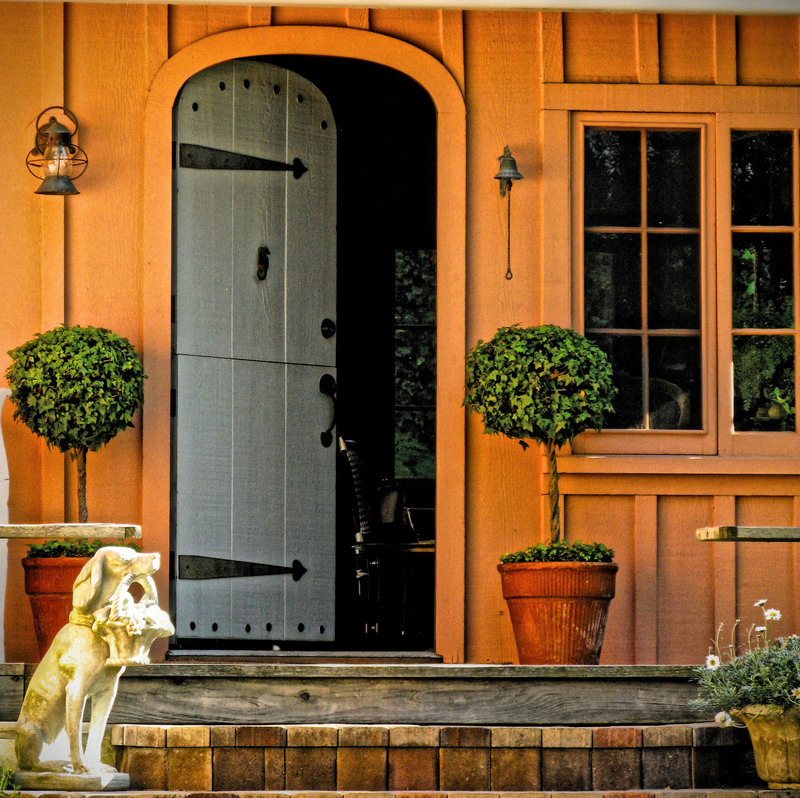 Hugh Comstock ,of fairytale cottage fame, designed its door. 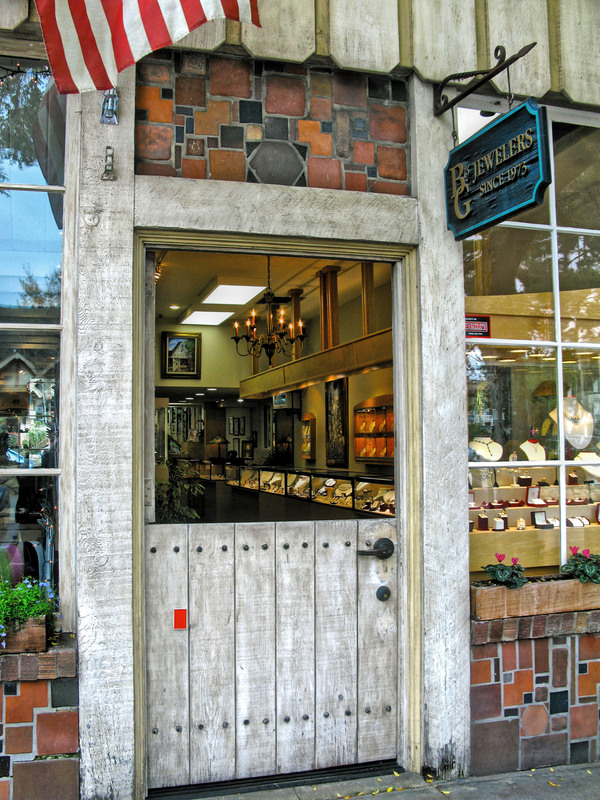 Even when I scoot down one of Carmel’s secret passageways, dutch doors are open. 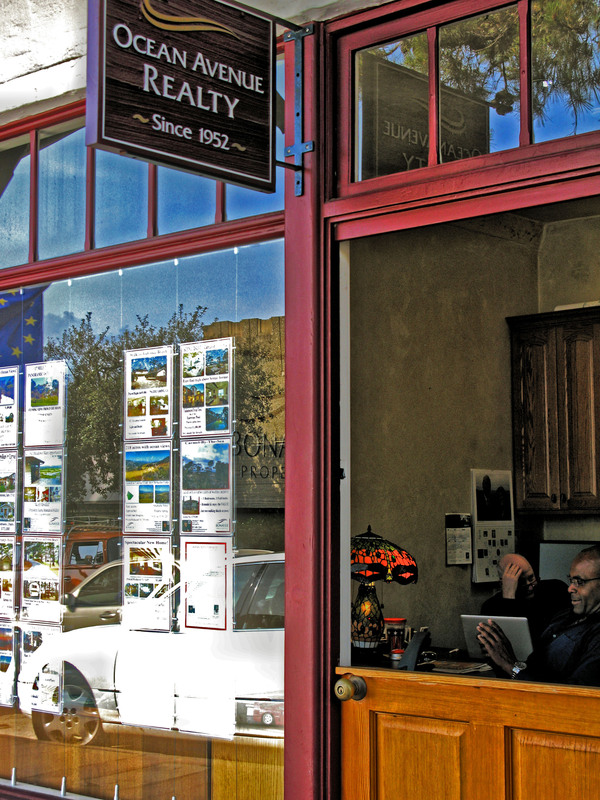 The realtors of Ocean Avenue Realty duck down when I take a shot, but rally when I tell them I am going to blog about them. They are posing – all business for the shot. Then they put their feet back up on the desks, lean back in their chairs and grin. and then I am back in my residential neighborhood. Darn. 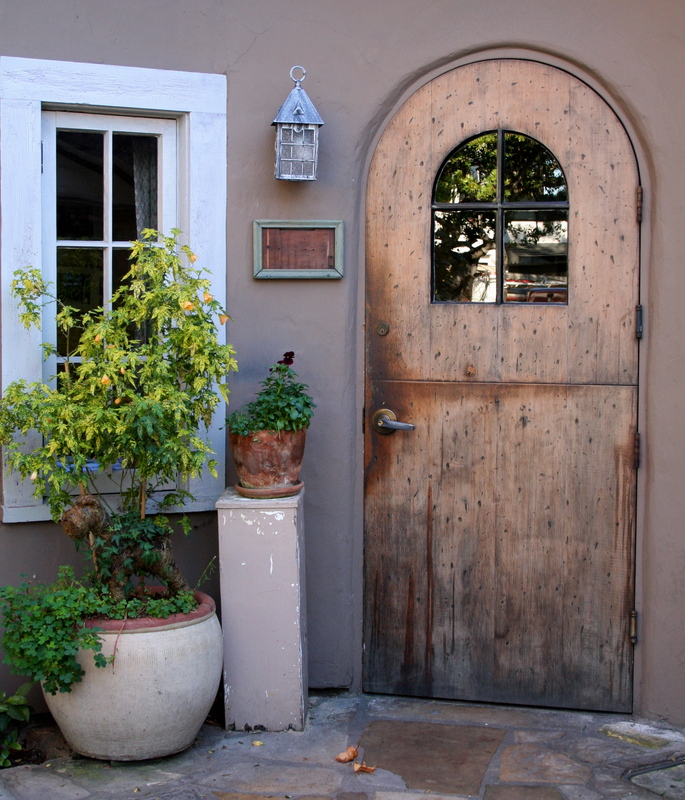 Maison Rustique ‘s dutch door is closed today. I love it when it is open. I leave you with this irreverent quote about my favorite door. Such a fun post. I love them also. Just a peek inside or a quick hello as you pass an open one. 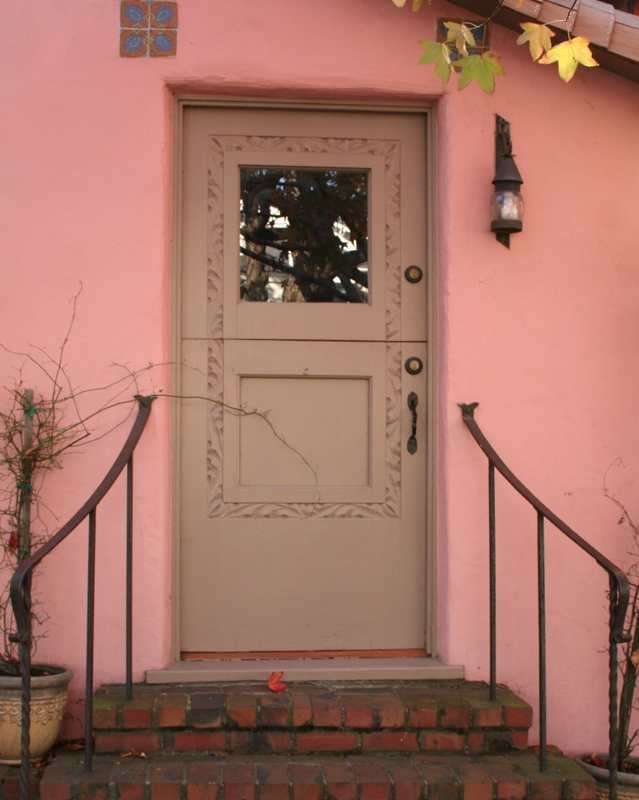 Good to have Dutch doors when it is Halloween too easy to give out candy and stay warm inside! 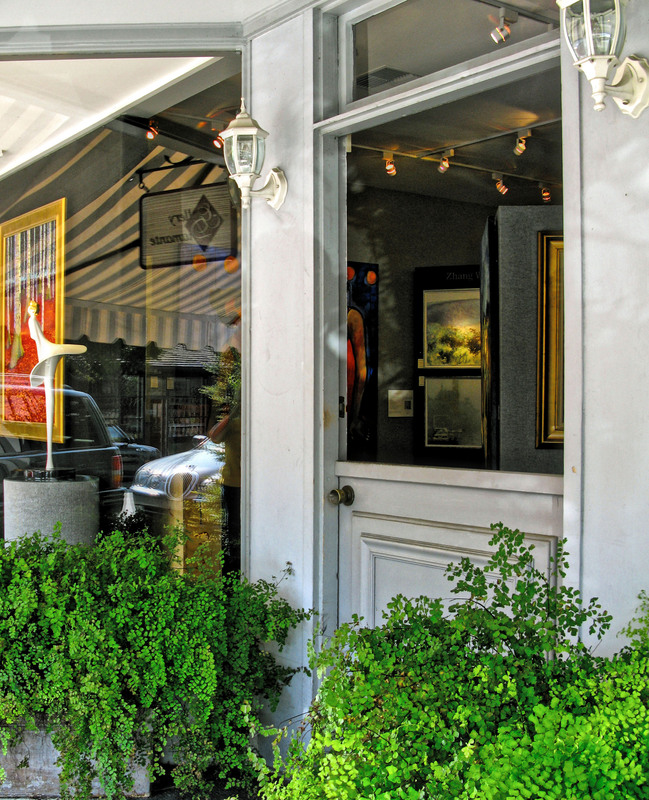 I have always loved Carmel since my first visit at 21, but seeing it through your eyes, I see more than the sights and sounds I have been used to ….I see the heart and soul of this timeless village and I thank you so much for sharing.